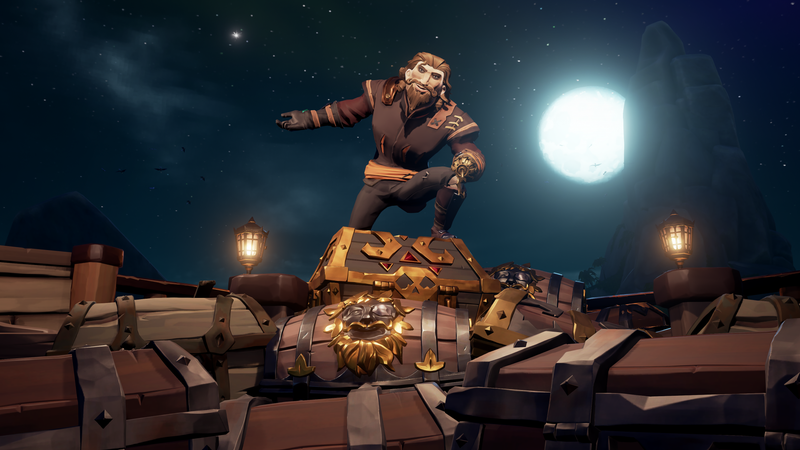 This article focuses on what it’s like to play Rare’s multiplayer pirate simulator Sea Of Thieves all by your lonesome. Next week, we’ll be following it up with a roundtable discussion based on the A.V. Club staff’s multiplayer sessions. Sea Of Thieves, the big Microsoft exclusive the Xbox-maker is hoping will keep people distracted until the next Halo or Crackdown comes out, is all about having nautical adventures with your friends. You play as pirates in an online ocean full of other pirates and their friends, and with no real story to speak of and no justification for what you’re doing beyond an endless quest for gold and experience points, it’s pretty much up to you to determine why you’re doing this. That’s easy when you’re playing with friends, since it’s just hanging out with your buddies while digging for treasure and killing skeletons, but it’s a completely different experience when you sail by yourself. One of the hooks of Sea Of Thieves is that every aspect of commanding your ship is up to you, so you have to raise the anchor, drop the sails, angle the sails into the wind, and steer the ship. You can divide up the tasks with a crew (something that’s necessary when working on a larger galleon), but it’s all on you when you play by yourself. That makes the basic act of sailing—the thing you’ll be doing most in Sea Of Thieves—into an experience that can be so hectic that it’s almost calming. You can’t worry about real life if you’re focused on keeping the wind in your sails, and without your friends goofing around on deck, you can just focus on the simple joys of sailing. The problem is that progressing in Sea Of Thieves doesn’t really have anything to do with the simple joys of sailing. You have to complete quests for the three guilds located at every outpost island, quests that involve killing specific skeleton captains, following clues to dig up buried treasure, and—most exciting of all—capturing chickens. Doing that stuff gets you gold, which you can use to buy new pirate clothes and equipment upgrades that serve no purpose beyond looking cool, but you have to actually return to a port with the buried treasure, the captain’s skull, or the captured chicken in order to get that money. That’s where other players come in. At any point, another ship can roll up, kill you, and take the treasure you just dug up. That can happen when you’re with a crew, but playing solo means you’ll almost certainly be outnumbered and outgunned, and if you lose the treasure you won’t get any reward. If you’re lucky, they’ll take your treasure and run. If you’re not, they’ll sink your ship and leave you to respawn on a random island somewhere else. If you’re extremely unlucky, they’ll leave your ship floating and camp your respawn, killing you over and over again until you simply give up and scuttle the ship yourself through a menu. Getting stuck like that is awful and it ranks up there with one of the most unpleasant experiences you can endure in any online game. It not only involves you wasting your time by failing a quest but also having to put up with some jerk who is purposefully trying to make you have a bad time. That’s the game, though, and it’s kind of hard to fault Sea Of Thieves for having a… sea of thieves, but the end result is that working toward the quests is just a bad idea if you’re sailing solo. That being said, there is fun to be had once you reject the idea of playing the game “the right way.” Possibly my most exciting Sea Of Thieves moment came when another team snuck up and killed me while I was digging up a chest. By the time I respawned, they had carried it back to their galleon and were preparing to sail away. Rather than fighting back, I snuck onto their boat, tossed some of their treasure overboard, looted their supplies, and hid on the bottom deck as they sailed to a port. My plan was to wait until they dropped the anchor and then steal the ship so I could crash it while cackling like a madman, but after a few minutes of being a stowaway, they spotted me. It was silly, and it was the sort of thing that I couldn’t have done in any other online game I’ve ever played. Really, the best way to enjoy a solo session of Sea Of Thieves is to make your own fun. Don’t worry about the quests, because they’re not particularly interesting even when you have friends, so just be a damn pirate and do whatever you want. Sail for an area you’ve never been to and see if it has anything cool. Pretend you’re allied with the evil skeletons and arbitrarily attack players when they step foot on your island. You could even hide on someone else’s ship and see how many of their bananas you can eat before they notice. Playing Sea Of Thieves alone is far from ideal. It’s not the way the game is meant to be played, and it’s certainly not the way the game should be played, but it’s not unbearable. You just have to know what you’re getting into: a world where it takes an hour to do one thing that you might get killed while trying to do, and in the end, you might not have a ton of fun doing any of it. You’d probably just be better off finding some friends to sail with.